The Sustainability Leadership Program has helped make one of the world’s biggest financial organizations more efficient, while reducing its impact and becoming more sustainable. For HSBC, whose energy consumption is equal to that of a small city, this is no easy task. To succeed, universal buy-in is needed from the top. The program was designed to tackle sustainability using the organization’s most influential decision makers. With the scale of HSBC’s operations, the reach of its customers, and the influence it holds over its investments, the program has potential to make significant global changes. The Sustainability Leadership Program is a unique professional development experience for senior leaders from HSBC, designed to promote a deep understanding of sustainability. HSBC employees have contributed more than 11,000 hours to Earthwatch research as part of the Sustainability Leadership Program. Earthwatch has worked with HSBC employees around the globe, helping them understand and engage with environmental and sustainability issues. The HSBC Climate Partnership (2007-2011) was a five-year program on climate change to inspire action by individuals, businesses and governments. How did HSBC get involved? 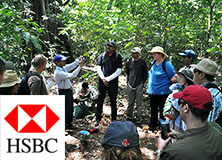 The Sustainability Leadership Program was collaboratively designed by Earthwatch and HSBC in 2009 for senior business leaders from HSBC bank. In 2007, Bill Thomas, Global Head HSBC Technology and Services Sustainability, attended the Earthwatch Climate Champion Program at our North America Regional Climate Center. He was so inspired that he approached Earthwatch about designing a program for senior HSBC executives, and this resulted in the Sustainability Leadership Program. What happens in the Sustainability Leadership Program? 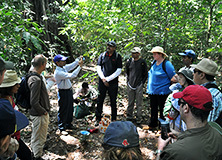 The senior managers who become Sustainability Leaders participate in an intensive training program where they work with Earthwatch scientists on a climate change-related research project and take part in structured sustainability learning sessions relevant to HSBC co-delivered by Earthwatch and HSBC. Facilitated sessions focus on how Sustainability Leaders can support the HSBC Sustainability Strategy, generate efficiency savings, and drive sustainability engagement within their part of the business. 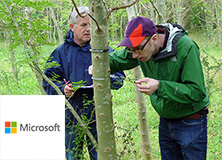 HSBC employees work alongside Earthwatch scientists undertaking field research and, in doing so, contribute to vital data collection and learn about climate change. 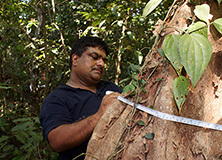 The program has taken place at Earthwatch sites in Brazil, China, Costa Rica, India, North America, Malaysia, Mexico, and the U.K.
Earthwatch’s first formal partnership with HSBC was Investing in Nature, a five-year partnership launched in 2002, featuring the World Wildlife Fund (WWF) and Botanic Gardens Conservation International. Building on the success of this, in 2007 HSBC launched the HSBC Climate Partnership, partnering with the Climate Group, Earthwatch, the Smithsonian Tropical Research Institute, and WWF. The HSBC Climate Partnership was a $100-million, five-year program to reduce the impact of climate change and accelerate the adoption of low-carbon policies. In 2012 Earthwatch, WaterAid, and WWF partnered with HSBC in the HSBC Water Programme to provide and protect water sources, inform and educate communities in need, enabling people to prosper and driving economic development across the world. The five-year programme was extended in 2017 following its success over the initial term. The extended eight year, US$150 million programme will align with the UN Sustainable Development Goals. 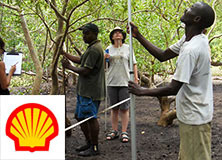 The Sustainability Leadership Program has been running since 2009. By the end of 2013 more than 600 senior executives had participated. The Collaborative Program piloted in 2013 with HSBC and their supply chain partners HP and SAP. 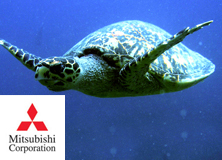 Learn more about how sustainability can transform business partner relationships. HSBC employees undertake field research and contribute to vital data collection. HSBC managers collaborate in a structured sustainability learning session.